The Path of Haveshi Yellowcrow: When ill fortune strikes Haveshi's clan, the remedy is heartbreaking for the young wife and mother. Guided by the Yellowcrow, god of the forsaken, she sets out on a path to regain what she lost. The Path of Latan the Clerk: Latan, a lowly clerk in service to the magical Source Tiati, has discovered a historical document of great importance, and is summoned to present his findings to the high priest of the Empire. Accompanied by the warrior named Haveshi Yellowcrow, he embarks on the journey of a lifetime and finds unexpected danger and self-discovery. 3.0 out of 5 starsKeep the title in your mind so you will remember the players. I was rather disappointed at first, I couldn't find the rhythm of the story. The missle was quite interesting. I lost view of the story again when the holy man appeared, but finally realized who he was by the end of the book. The fault my be entirely mine as I have not been feeling well so did not read as quickly as normal. Please enjoy on you own. I thoroughly enjoyed this book. The writing style was excellent, with very believable characters in a well crafted world. The storyline kept me turning the pages quickly. The descriptions were rich and drew me in right from the first page. Well done, Kyra Halland! 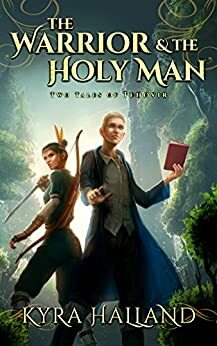 I found this to be an investing concept, though I would have liked more insight on why the warrior and holy man fell in love. It felt like part of the story was missing. I liked the characters and the Native American theme to the book. I think another couple of chapters would have made this book better. Well written and lean, Cowboys and Indians meets medieval Europe. Wild and entertaining, magical events amid betrayal and a vision quest for the truth. Loved the Native American take on a fantasy world. The second half felt a bit rushed but in a way that left me wanting more. Looking forward to reading more in this world.